How to get started with Let's Enhance? Welcome to the very first step! In this quick article, we will show you how to get started with Let’s Enhance. How to increase the resolution of your picture by 4 times. How to improve colors in a second. How to change the tones of your picture to make it more smooth. Then simply choose the photo you would like to upload. Tip: The best pictures to choose for use will be covered in the next article. Increase image resolution, which will make your picture 4 times bigger. Example: You have a picture that is 500 x 500, but you would like to use it for printing, content, presentation, social media marketing or, let’s say, for an e-commerce shop. In this case, you will get the same image with better quality and (!) with the new resolution of 2000 x 2000. Photos and art are good choices when you would like to use the photo with a lot of details. Logos and cartoons are the best ones for simple graphics. 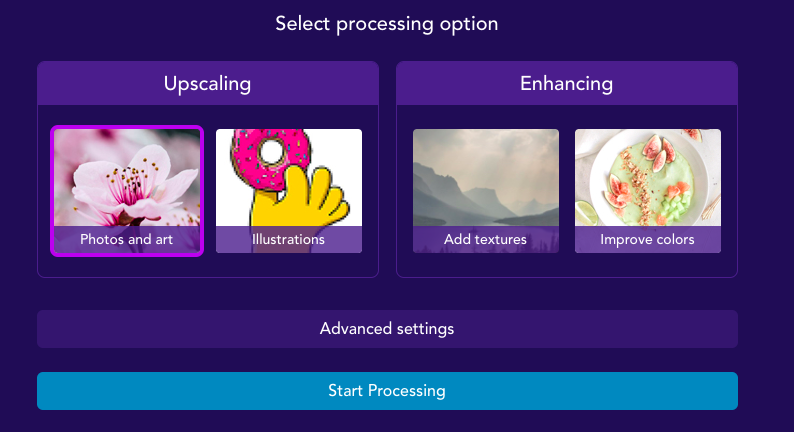 The Add Textures feature will add a “light-HDR” filter to your picture, but will keep it looking normal without all these ugly pixels, like the average smartphone does. If you want to add some kind of contrast to your photo, then “Improve colors” is a good place to start. The next step is creating your account. This one is a super important step. We will create an account for you where you can manage all of your pictures easily and conveniently by uploading new ones or downloading the existing photos - all of these can be done easily from your personal dashboard. Tip: Confirm your email to add extra privacy to your account and be able to work with all your images. And the last one...bingo! Your own personal space on Let's Enhance! Now you know how to get started and choose the best options to edit your pictures. Let’s jump to the next article: What type of images can I use with Let’s Enhance?